Reef Entertainment company has shared some great news with its fans - Rambo The Video Game release date is officially confirmed. According to the developers, the game will be available in Europe, Australia and New Zealand from February 21, 2014. Although, the information about its launch in North America is still unknown. It should be noted that players, who will make a pre-order of Rambo The Video game, are going to get a special extra bonus - one of the two hand-made 3-inch figurines of Rambo. Both statuettes are uniquely alike with the main character, they have exclusive weapon and clothes. While playing Rambo The Video Game, the users will feel themselves in the role of the famous hero, who travels through the events from three legendary movies - First Blood, Rambo: First Blood Part II and Rambo III. Also, the fans will be pleasantly surprised once more! Rambo The Video Game will include a few soundtracks, selected from three films, and the original voice-tracks of the main actors - Sylvester Stallone and Richard Crenna - Colonel Samuel Trautman. But there’s more to come! 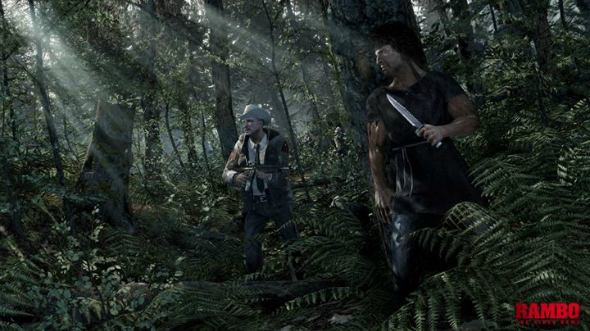 Reef Entertainment has announced the development of DLC for Rambo The Video Game on its official Facebook page. However there’s no detailed information about the new content yet.